TSE 852: Break The Rules...Take A Risk! 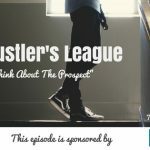 Home » TSE Podcast Post Page » TSE 852: Break The Rules…Take A Risk! Sometimes, rules survive long enough to become folklore. We adopted them as our own even if they aren’t necessarily good for us. 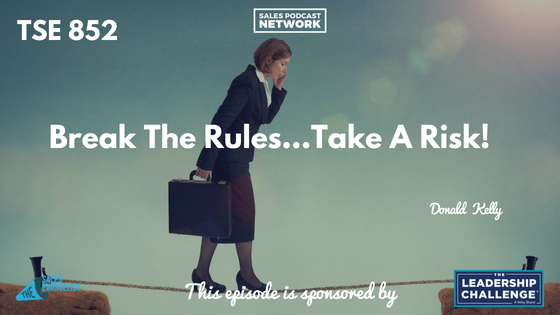 As sales professionals, we must break the rules. Today on The Sales Evangelist, we discuss the importance of taking educated, calculated risks in order to improve our process. I’ll tell you about a risk I took as part of my social selling experiment, and how it panned out. Sales professionals follow a lot of prospecting rules, like the one that says that the phone is the best way to prospect. As technology evolves, we’ve seen less success with the phone, so we have moved to social media. The Sales Evangelist team spent the entire month of May focused on effective social selling. We’ve bought into the idea that snail mail doesn’t work. We discount it as a waste of time and money, which may be true if you aren’t using it well. The same is true for the phone and social media: the key to success is understanding the process. For the past few weeks, I’ve told you about an experiment I’m doing to test the rules. I’ve identified 40 prospects to contact via social media, and 40 prospects to contact via phone to measure the effectiveness of each. About 3/4 of the way through my experiment, I realized that I wasn’t seeing much fruit from either effort, so I combined the two. I found prospects via phone, and I connected with them on social media. 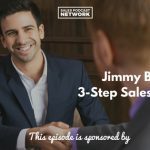 Then I did the reverse: I found prospects on social media and connected with them via phone. I reached out to lower-level people within the company to determine what challenges the company was facing that I might be able to help solve. In many cases, I spoke to the executive assistant in an attempt to gain an ally in the company. The executive assistant acts as a sort of talent scout for the decision-maker, so if you can get that person in your corner, you will be more likely to gain access to the executive. Then I decided to break the rules. I was reading the book How to Get a Meeting With Anyone by Stu Heinecke, which is all about content marketing. It teaches how to get in front of the prospect and let him know that we exist. I sent a large box with popcorn, a drink, candy, and an oversized ticket to each of 8 prospects, inviting them to a demonstration. We didn’t do this for every prospect; just carefully-selected companies that we knew had a need or a challenge we could fill. The effort took a little more work, and it was more expensive than our usual efforts. But of the 8 companies we contacted, 6 of them have set up demonstrations. We’re still working with the other 2. We discovered that most people aren’t using snail mail, and most businesses only receive bills and junk. When we send a package with a hand-written label, and then follow it up with our usual techniques, we grab the attention of the person we sent it to. We tried it on a small scale, and it produced good results, so we’re working now to scale it, and that’s what I love about experimenting. I’ve spent a lot of time talking about the book Stop Selling & Start Leading because I believe so strongly in the message it has to share. It’s a blueprint for sellers based upon years of research about the things buyers hate.